Stains — they’re one of life’s most annoying little mishaps. If only there was a way to easily get rid of stains without harming your clothes and the environment. While we can’t give you a silver bullet solution for stains, we can offer you some smart advice that will make stain removal much easier, cleaner, and greener — it all comes down to basic chemistry! Now that we’ve addressed laundry room design, smart machines, and user habits, let’s get down to something dirty. That’s right — the unavoidable, inevitable, and incredibly irritating stain. Not only do synthetic one-step stain removal products normally not work very well, but they can harm natural fibers such as silk and wool. Besides that, they’re often flammable and can cause an allergic reaction in people sensitive to the harsh chemical ingredients, not to mention the fumes they emit during use. Luckily there are safer, more eco-friendly alternatives if you understand the chemistry behind the stain. The longer a stain sits, the more it sets. Don’t delay getting down to cleaning the stain in question. Also, check to see whether your first try was successful before you put the item through the dryer. Once a stain is exposed to heat, it is virtually impossible to remove. Remove as much of the stain as possible before getting down to the nitty gritty. Blot, scrape, scratch, but whatever you do, avoid the rub. You’re just pushing the offending matter deeper into the fibers when your rub the stain. Once exposed to hot water, a stain is more likely to set, so try to wash stained items in cool or warm water. Coffee, tea, wine, or other tannin stains – Try vinegar, sodium perborate, or glycerin. When all else fails, try an enzyme-based cleaner. Tomato, oil, fat stains – Try pouring boiling water over the stain in a bowl, cornflour or baking soda can also help absorb and lessen the stain. Ink, blood – Soak in milk. Hydrogen peroxide also works wonders on dried blood. 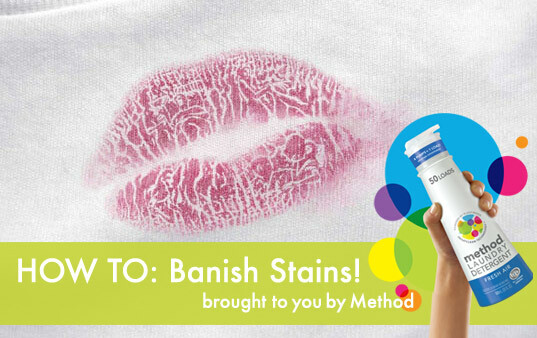 Lipstick, make-up – Glycerin can be great but be careful not to pour it on beyond the stain. Then pre-treat with regular detergent and wash warm. Wax, chewing gum – Freeze the stain and chip it off. We also read that ironing a wax stain between paper towels can be really effective too. The iron heats up the wax, the paper towel absorbs it. Don’t try this with the gum. Ring around the collar, perspiration – Try shampoo which is formulated to remove body oils. Urine, vomit and the really gross stuff – Vinegar is a great place to start, if not enzyme-based cleaners can get rid of the nasty stuff. 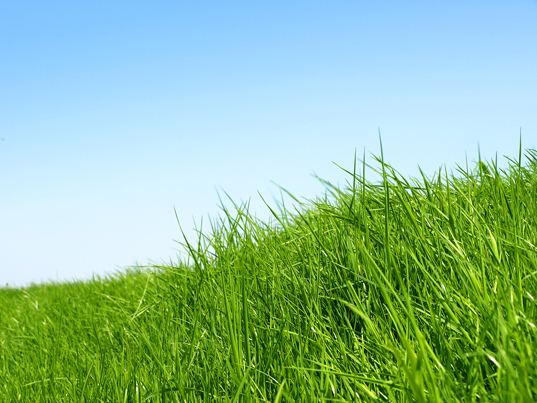 Grass – Frothy and eco-friendly hydrogen peroxide is a wonder at removing tough grass stains. 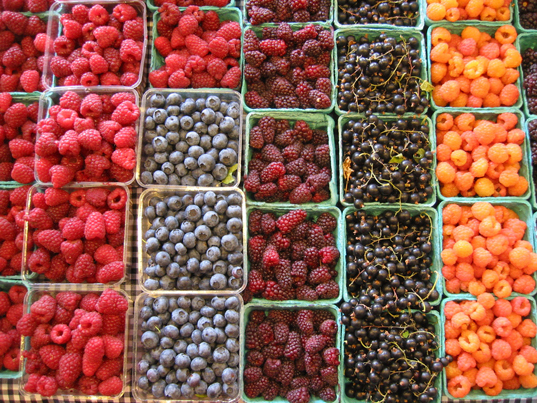 Berries – Vinegar typically works well, removing these acidic stains. Of course, everyone has their own secret stain removal methods. Are there any tried and true eco-friendly secrets in your green household? Focused on doing away with dirty, Method was started to bring consumers environmentally friendly alternatives to the harsh chemicals traditionally found in cleaning supplies. Method’s founders, Eric Ryan and Adam Lowry, realized people wanted cleaning supplies they didn’t have to hide under the sink or in the closet, so they got started developing new alternatives to old standards. That’s why you should check out Method’s brand new laundry detergent. Made with smartclean technology™, a patent-pending formula using a radical technology, Method Laundry delivers outstanding cleaning power but with 1/4th the dose of the leading national brand. Imagine 50 loads in one lil’ bottle that works in H.E. + standard machines. 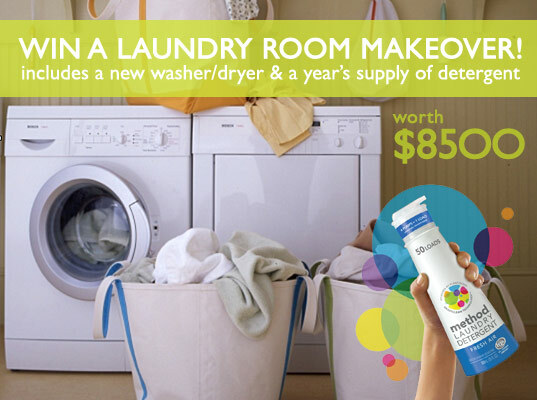 Don’t forget to enter the Method Laundry Room Sweepstakes today for a shot at winning a stunning green laundry room renovation worth $8,500! Inhabitat has teamed up with Method to stock your laundry room chock full of a year’s worth of laundry supplies, a new energy efficient washer and dryer, and a set of eco-friendly laundry room furnishings. The competition ends on April 16th, so if you haven’t applied yet it’s time to get cracking! Stains -- they're one of life's most annoying little mishaps. If only there was a way to easily get rid of stains without harming your clothes and the environment. While we can't give you a silver bullet solution for stains, we can offer you some smart advice that will make stain removal much easier, cleaner, and greener -- it all comes down to basic chemistry!